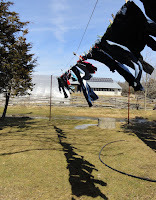 My husband put up a clothes line for me......I love it! Makes me feel like I am living in a time when things were a little more simple! Enjoy your fresh sweet smelling laundry! I'm always astonished by the scale of what you do - now I'm even surprised by the length of your line! Lucy - now you're making me embarrassed to admit that this is only one of my lines - you can just the shadows from the other one (and the end post) on the right of the photo.